Marketing a product is a rather simple idea. Heck I'll be honest. I fell into Marketing in College. I took one course and found it to be so easy that I made it a career. People tell me that it's because it comes naturally to me but I rebuff, it's really easy. Have a customer target, have a product that solves the problem and be willing to spend the right amount of money to connect the customer to your product. Everything else is just noise. This week has been full of noise. That's not the customer this is. The product isn't right it needs this. Blah, Blah, Blah, Blah. Get back to basics people it will help everyone out. Who's the customer. Not what's the customer, who's the customer. What's their name, where do they live, and why do they run. What's the product, why will they need this product. The rest of the stuff is there if you figure one and two out. The above picture really has nothing to do with this posting. It's just a fast bike that some Pro athlete probably got for free. If anybody had actually bought this bike, they paid too much I'm sure. Retail value as is tops $7,000. My first two cars did not add up to $7,000 value. But then again they didn't look this fast. Maybe I need to go 5 seconds faster. I think my back can handle that position. 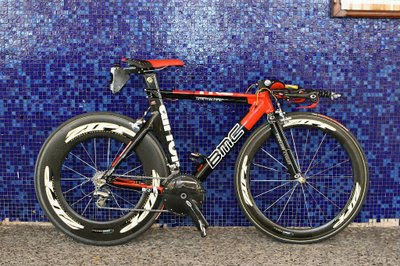 BMC I think their Swiss, known for precision craftmanship. Zipp are the "Speed Weapons" or something like that. I think I'm going shopping. Oh rats, even good marketers can be marketed upon.